One of the easiest ways to completely transform a room is through the use of area rugs. They have the ability to instantly add color and texture, setting the tone of any space from the ground up. Think of adding a rug like adding apiece of artwork. With the right placement they can add personality, bring attention or soften a room. They have the ability to add layers to a space and elevate the entire room. Not to mention, they just make spaces more comfortable! Here are our tips on picking out the perfect rug for any space every time. Choosing the right size is the most important part of purchasing a rug. 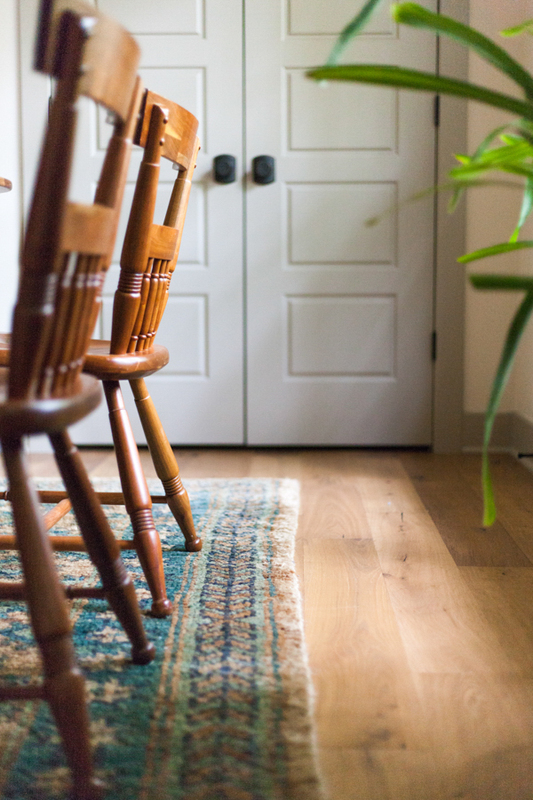 One of the most common mistakes we see people making is buying rugs that are too small. We can definetely understand why...it's hard to really know and the smaller rugs are cheaper! Unless you are living in a tiny house or loft apartment in a busy city, your living room is probably going to need at least an 8x10, but much more likely of a 9x12. The one exception to this rule is cowhides. They are a sculptural piece so their organic shape adds so much to a space and they are not meant to go under all furniture legs. If you are thinking you may have bought a rug too small though, it's not necessarily too late to fix it! One tip we have for fixing a rug that may be too small without completely tossing it, is to buy a natural fiber rug and layer it underneath. They are often inexpensive and have the ability to expand a space. Layering can be a great solution to scaling and adding additional texture. As you can see this is something we took full advantage of in Lucky 33's den. Rugs come in so many variations which is why picking a pattern can often seem like an overwhelming task. A foolproof way to pick a pattern is to pick something that is timeless and has remained a classic. For example, stripes, plaids, persians, solids, natural fiber rugs and simple patterns are always going to be in style. Neutrals and classic colors such as navy are going to be more versatile. That is not to discount a beautiful, colorful persian that will work as a neutral in a space. A good general rule of thumb is the brighter the color (think electric/neon), the trendier it probably is and the shorter the lifetime of the rug. As quickly as it might have caught your attention, it will be outdated even faster...(remember the big, bold and bright chevron explosion that happened several years ago). A rug can be a great investment, and with the right pattern, it can last you long term. Patterns are also a great way to hide stains or the wear and tear in a home. So when picking a pattern, keep in mind the lifestyle of the space. Do you have kids or pets that use it? If so, an overdid or distressed rug can be a great choice. They have a "lived on" look and can camouflage mishaps, therefore increasing it's longevity. How to set the rug in your room with furniture. When it comes to living room rugs, there are 3 placement options you can choose from: no legs on rug, front legs of furniture on rug, or all 4 furniture legs on the rug. Our personal favorite is setting the front legs of all the furniture pieces on the rug. This is our favorite look because it pulls all of the pieces together and grounds the space. It also avoids having to buy an extremely large rug that fits the entire furniture pieces on it. Another tip for a living room that goes back a bit to scale is to make sure you have at least 6-12 inches of rug sticking out on either side of your sofa or sectional. It will not look right to have a rug that doesn't extend beyond your largest seating option. So, if your sofa is 8 feet long, you will want your rug width to be larger than 9 feet. When considering rugs for a dining room, we recommend buying a rug large enough to fit at least 24 inches past the dining room table on all sides, but it can extend further. This is keeping in mind the additional space needed for when guests scoot in and out from the table. No one likes being on the wobbly edge of a carpet. Rug choices also differs for bedrooms. You have to think about how much of the actual rug you want exposed. (Our recommendation is a good portion, at least 24 inches on both sides and the foot of the bed). Most bedrooms need at least 8x10 for a full or queen size bed and a 9x12 if for a king. If you are someone who wants to step out of the bed first thing in the morning on something soft, then you need to go with a large enough rug that all of your furniture sits on it (nightstands and bed). Or you might want to consider carpet in the bedroom. Even if your bedroom is already carpeted, layering with an area rug can bring a whole new look!